Planetary Geomorphology Image of the Month, January 30, 2017: Petr Brož (Institute of Geophysics, Czech Academy of Science). Volcanism is an important process which shapes the surfaces of all terrestrial planets, and is still active on Earth, Jupiter’s moon Io, and perhaps on Venus. On Earth, volcanoes with wide variety of shapes and sizes exist; however, the size of volcanoes is anti-correlated with their frequency, i.e. small volcanoes are much more numerous than large ones. The most common terrestrial volcanoes are represented by kilometre-sized scoria cones (Figure 1a). These are conical edifices of pyroclastic material originating from explosive volcanic activity. Degassing of ascending magma causes magma fragmentation on eruption piling up the pyroclasts around the vent as a cone. 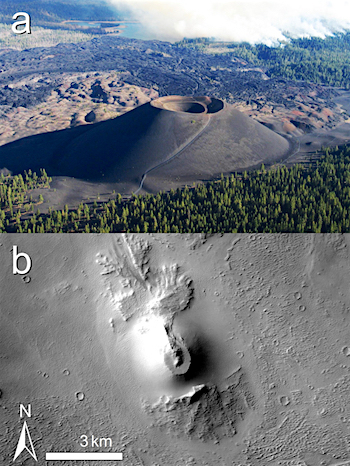 This entry was posted in Reports and tagged cinder cones, pyroclastic eruptions, scoria cones, volcanics. Bookmark the permalink.